All the important references on diet, as well as some previously unpublished manuscripts, are compiled here. Published by: Review & Herald ... pp. 512. Counsels on Diet and Foods is a topic is a vital importance.... the book's annual sale is large! The book has been commented on by several research scientists. 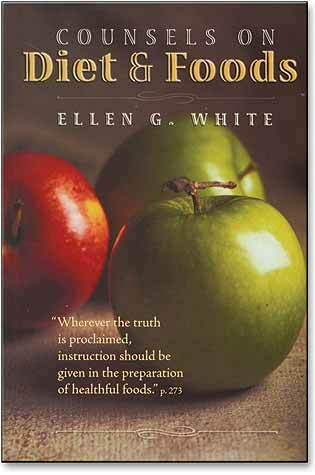 One, Dr. Clive McCay, long-time instructor of graduate students in nutrition at Cornell University, after discussing The Ministry of Healing and Counsels on Diet and Foods, declared orally and in print: "In spite of the fact that the works of Mrs. White were written long before the advent of modern scientific nutrition, no better overall guide is available today." The heart of Dr. McCay's presentation confirms, from a scientific standpoint, of many points in this book, made long before the development of modern nutritional science. All for 12.99GBP. At that price you can pass them out as gifts to all your friends.